The Buster Hammer Carnival slot is a new game from Chance Interactive. 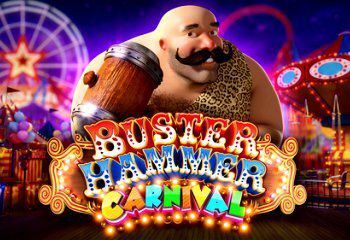 Play the Buster Hammer Carnival on SG platform with 3125 ways of winning. Buster is back and is BIGGER than EVER! During the Mighty Free Spins the reels expand to a 5×8 grid with a MASSIVE 32,768 WAYS to win! Gold wild Hammer only appears during the Wild Striker feature. The WILD STRIKER Feature is awarded whenever 1 or more WILD HAMMER appears in a win. All winning combinations on the triggering spin are awarded. Buster will hit the WILD STRIKER once for each reel that WILD HAMMER has appeared on. After each hit, starting from the bottom position, up to 5 symbols on the corresponding reel change to GOLD WILD HAMMER. All WILD HAMMER symbols on the reels also change to GOLD WILD HAMMER.